This year my bead soup partner really stretched my creativity. 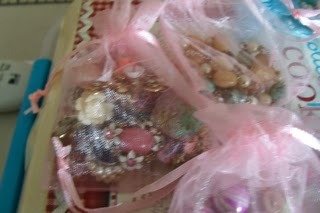 Nancy Olliver, better know as "The Mosaic Mermaid, sent me a box of beads, broken China, and two bangles. The box was packed so nicely that it took two days before I tore into it. I have to say I was a little scared to get started, and after a few emails to the queen of mosaic, I jumped in. Did I say that Nancy wrote the article "From Broken to Beautiful" in the Jewelry Affaire Magazine, Spring 2013. 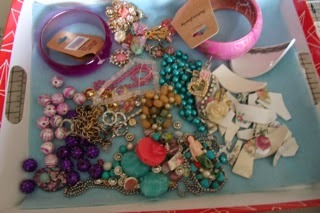 What a box of Treasures!!!!! 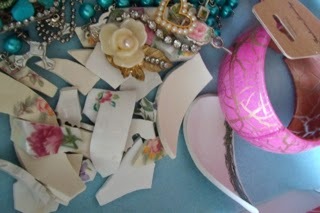 First, I had to break the China into smaller pieces to go around the bracelet. 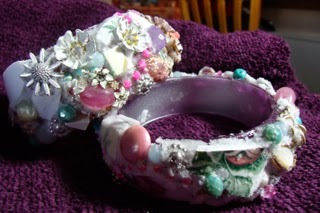 I have to say it was like a puzzle making the China, beads, and broken jewelry onto the bracelet. Above are my two bracelets before I used the grout. 2014 Bead Soup is almost ready!!!!! I will post my great soup project tomorrow---- Please hold on. Thanks for all the comments on last years soup. 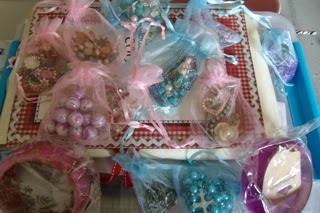 My LBS (local bead shop) had classes with Jeannette Cook this weekend. Click on her name to check out her website. 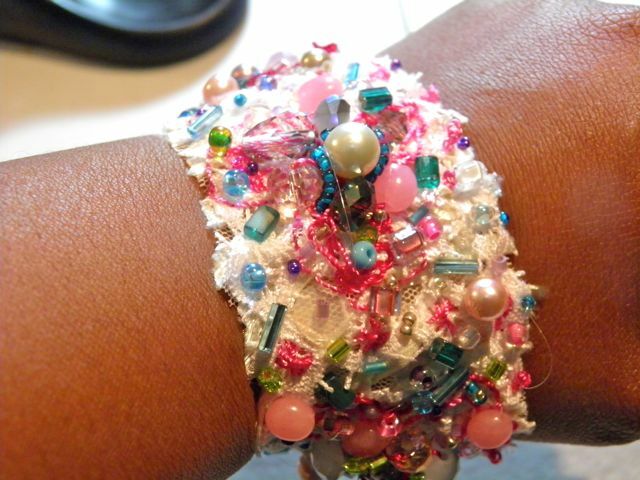 Now I swore off seed bead, I really said that I would never take a seed bead class. 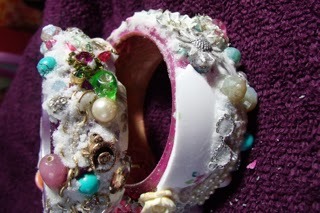 Well, I signed up for her Freeform Sculptural Peyote Cuff class that was this week. I love the class, this is what I have since Thursday night. I spent some time off and on this weekend between draining my hot water heater that leaked all over the floor. But I love it. 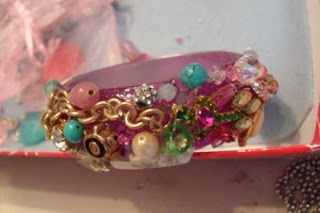 I just have to put the closure on the back of the bracelet and do a little more embellishment. I can't wait for her to come back in 2015, by that time I should know how to right-angle weave. 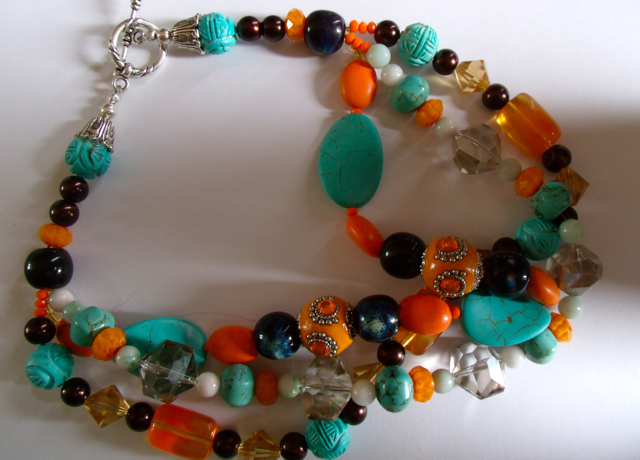 Last weekend I made this cool orange and turquoise necklace--- I'm in love with orange I think is is the new black for me. That is all I had time for this weekend that was fun. I spent most of my day reading Social Studies standards for my National Board Teacher Certification journey. I thought I was on the right path to begin writing this summer, but I'm not. Two weeks ago at the ceremony for the G. W. Bush library she had on this great gray pearl multi-strand necklace. 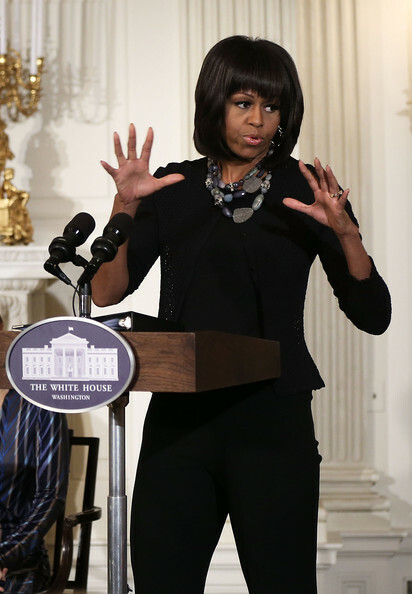 I googled her to get a closer look at it and found all the great jewelry that she has been wearing. 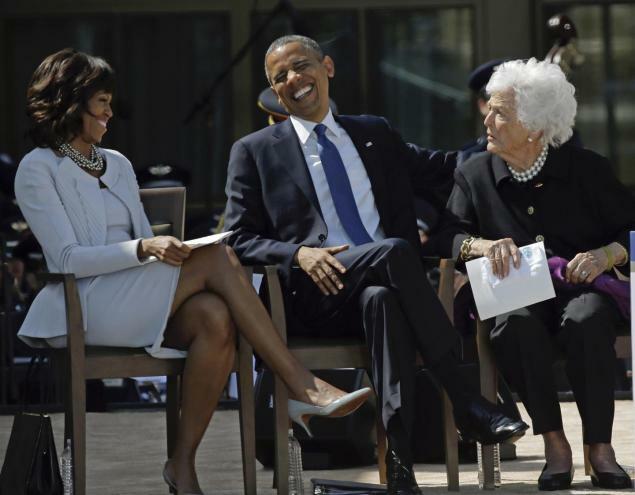 Don't you want to know what Barbara Bush is saying--- she is a hoot. I love this off center necklace. I just ordered the focal stone today from ZNET shows. I have been waiting months to show you what I made for my Bead Soup. Participating in this was sooooo exciting for putting my soup together, then receiving mine from Terry, to visiting 500 great beading artist blogs. Here is a small recap of my partner and what she sent to me. I just love the colors. Now it took me some time before I knew what to do with the focal --------- I have to do some thing special. 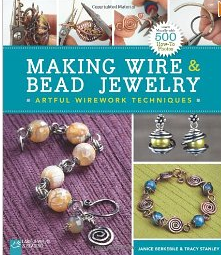 During the time my soup was simmering Tracy Stanely came to my local bead shop to teach Wire Jewelry classes. I took all but one because I knew I wanted to use what I learned to add some spice to my soup. 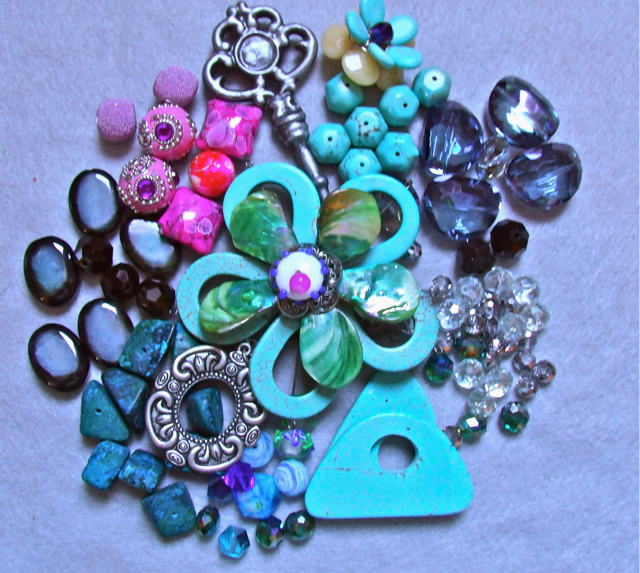 I'm a lucky girl right to have a local bead shop that brings great Jewelry Artist to Alaska. If you ever have the chance to take a class from her she is a blast. The book is also wonderful. Well with that said it time to dish up my soup. Come on and pull up a seat at my table. Do smell creativity??? Let me know what you think. What do you think?? 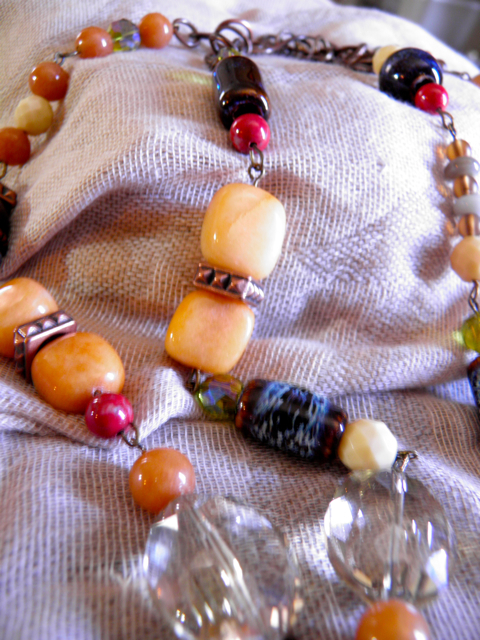 It is a two strand necklace I used eye-pins to put it together to give it movement and an organic feel when i wear it. 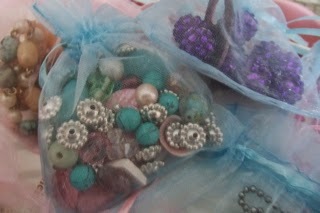 Let me tell you I were it all the time.The cranberry bead that Terry sent me just make the whole collection pop. I was also sent tiny flat beads in yellow, gray, and cream. What a collection. 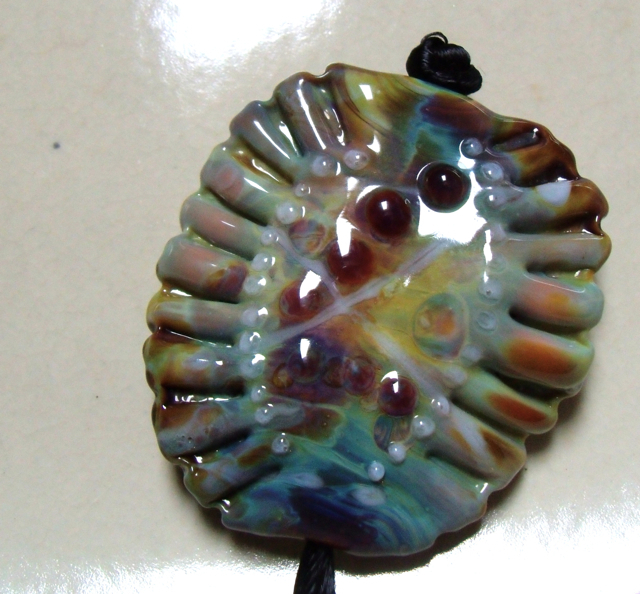 Now lets talk about that focal bead is it to just die for. When I opened the package I have never seen a bead that had so much detail so much to look at. I'm new to this beading thing. Yes, I have jumped in with my eyes wide open but this bead was so lovely tears of joy and honor came. At that moment I was scared that my soup could not match up to what Terry had sent me, but she loved it and made some wonder full jewelry. Check it out here. I'm going to give you a minute to savory the soup, taste the flavors, let the notes have a party in your mouth with each spoon full. 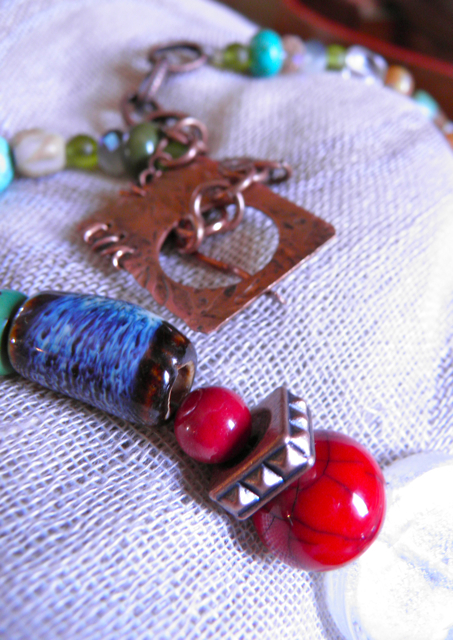 Let's start with the handmade copper clasp. More of those great ingredients that Terry sent in her soup. Don't those cranberry beads pop--- and those yellow one. I think I forgot to mention two spices that were sent one was a light brown bead that I just loved--I have been looking for more of the color--- it was a neutral that I feel in love with, and the cream bead that you see mixed through-out both pieces. Let me give you a second to finish your desert. The heart I made in Tracey's class it is 2 layers of metal that has been texturized. 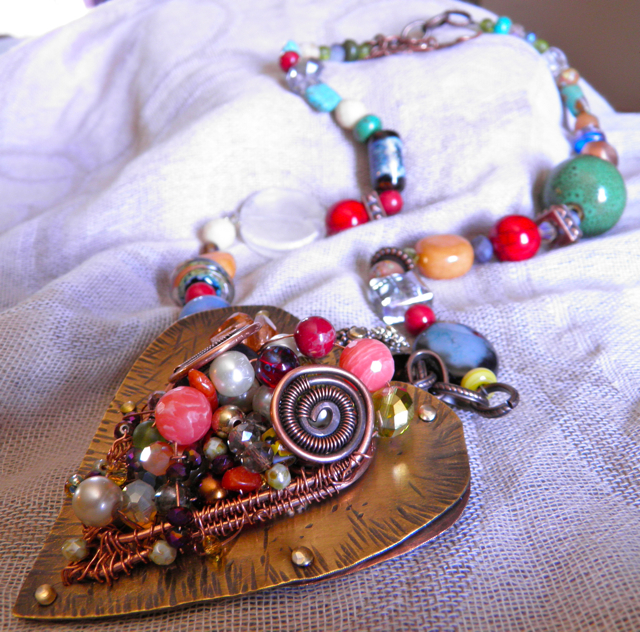 The heart in the center it wire that is wrapped and beads wired inside. Soup is ready Digging In!!!! 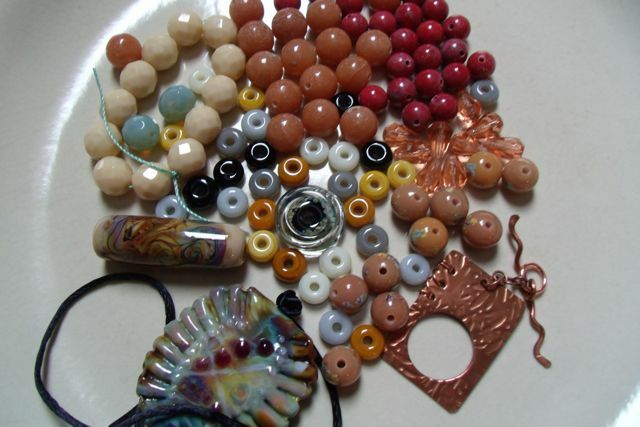 I joined the Bead Soup party go to the link to follow the 500 bead artist that have sent bead soup packages all over the world to fellow bead artist to make wonderful jewelry to wear and love. Go check it out. 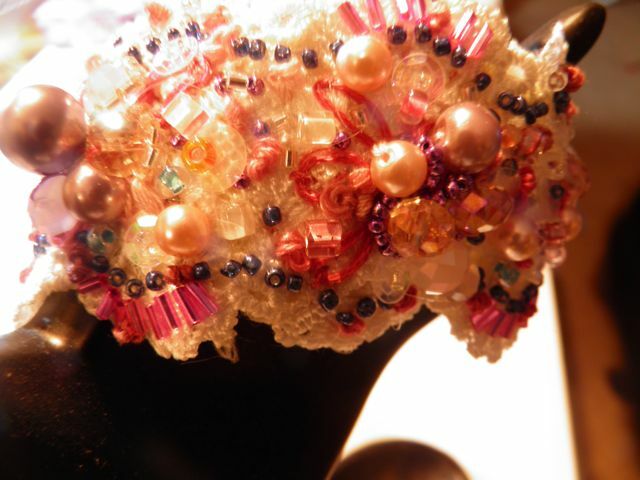 I took a beading class where I learned to make beaded flower that is what I sent to Terry for her focal. 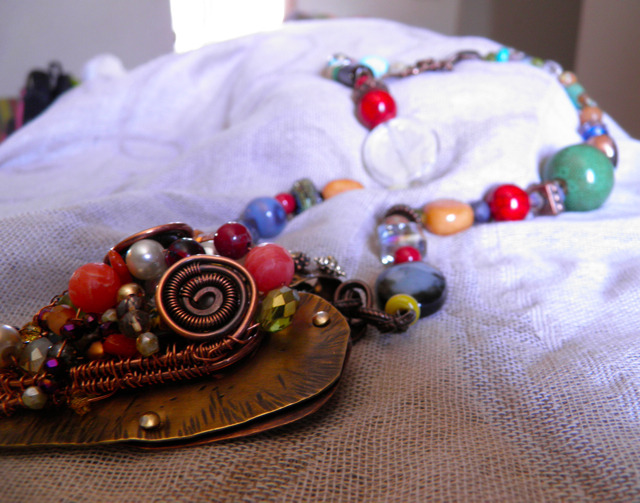 Then just for fun I made a small one and sent a key to help her unlock her creativity with this collection of beads. Terry asked what kinds of stones I sent here and I an such a newbie that I didn't know I just buy beads that I love the way they look or their shape or how much they shine LOL. Now for the soup that Terry sent me. I wish I could have a little self control when it came to opening my box but I didn't so I don't have any pictures--- I tried to put it back together to take pictures but gave up. I was the kid that unwrapped her Christmas gifts and re-wrapped then before my parents returned home. Here is my soup and I LOVE IT!!!!!!!!!!!!!!!!!!!!!!!!!!!!!!!!! 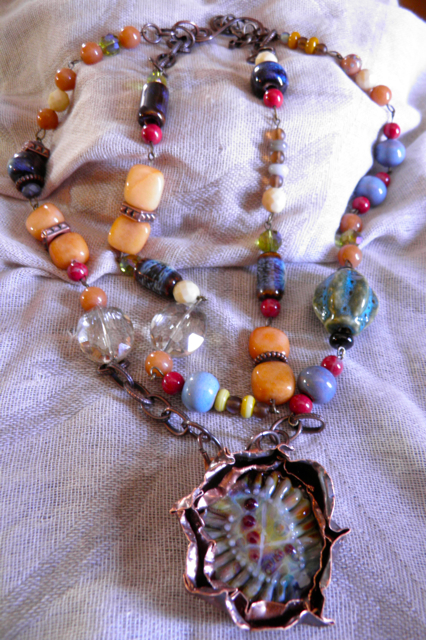 Look at that cool glass bead on the top--- I love the texture and the colors. Everytime I look at I see something different--- The bowl of soup is below I love it I have some ideas but you have to wait until April 13 to see what I do. This is going to bee too much Fun!!!! 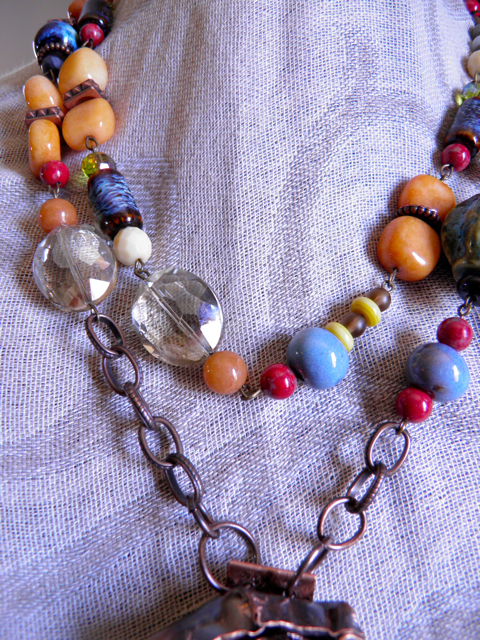 I love a challenge and I love swaps--- Bead Soup is the best swap of all. 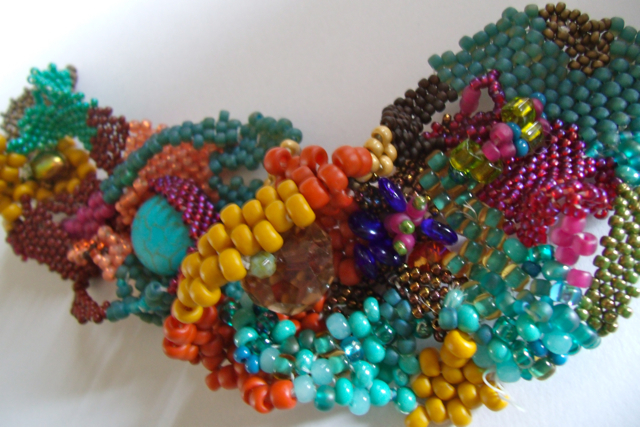 I get to send a mixture of bead, a focal and a clasp to my partner and she get's to stir my soup with her creativity and I get to do the same with her soup. Doesn't that sound fantastic?? The Soup is done and it will be on it’s way the the state of New York. It was a blast mixing, tasting and a pinch of this color and pinch of that color until it was bowl of color. This is my first Bead Soup--- I love the book and the idea of stepping out of my color zone to see how Terry’s soup feeds my creative soul. With all that said let me introduce you to my Bead-Souper partner. Terry Matuszyk from upper New York State. 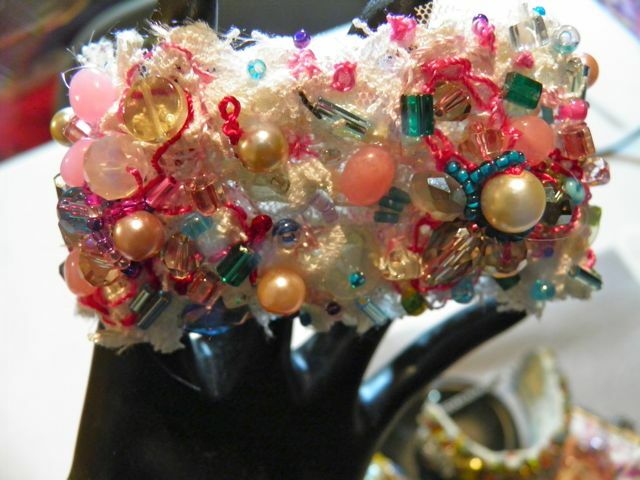 Terry got into beading about 6 years after taking a class she said it was love a first bead. I love her work. 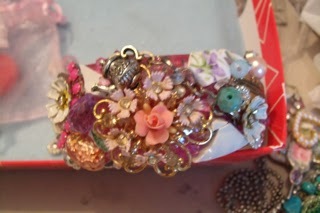 Terry has a vintage vibe with a burst of color---- I like that!!!!! We are a pair of gals that are not afraid of color or trying combinations that make you think and say I like that. We both wish we could just bead all day, but then we would need money to buy all those lovely beads that call our name while we try to sleep. 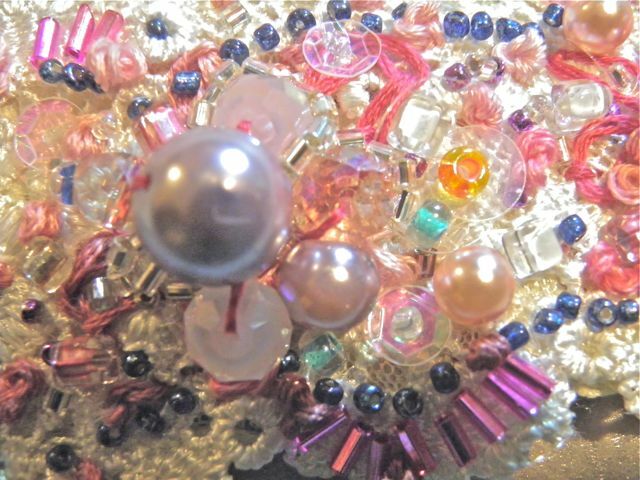 So we get up every day to go to work to support or beading habit. Here are the ones I made while I was watching bad TV. I love them. I haven't wore them yet waiting for the right outfit. I'm such an East Coast girl. 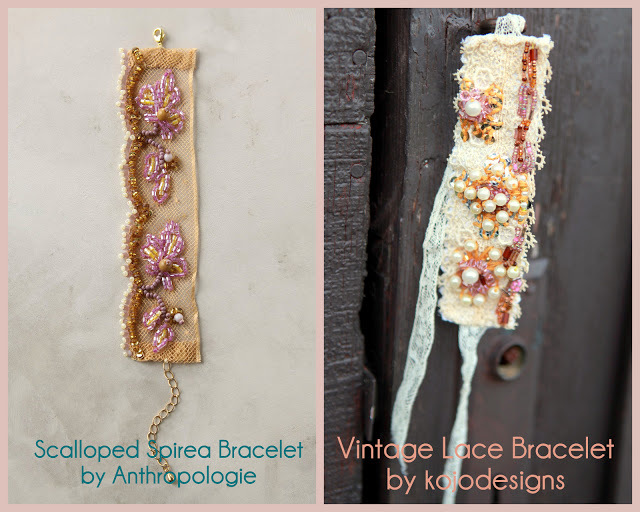 This is a great way to use left over bead from past projects. I really like those clear sequins. 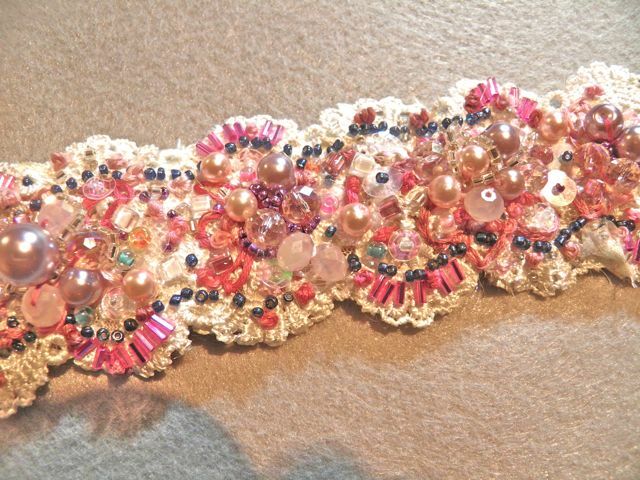 This one is the first one that I made it took me twice as long to bead as the one above. I am a teacher of students and teachers. I am a creative soul that loves to explore the artist that lives inside of me. I love to travel. I love the culture and spirit of Italy.